Dean has practised law in Ballarat for over 30 years. An active member of the Ballarat community and Buninyong Golf Club, Dean has been a member of Lions International and Rotary Ballarat, as well as the president of the Australian Royal Tennis Association. Dean handles commercial law, wills, estates and general property matters. Practicing In: commercial law, wills, estates, Defamation and general property matters. Richard has been practising law for approximately 30 years, the past 16 of which have been in Ballarat. Matters handled include Family Law, Crime and Crimes Compensation. Richard is a past president of the Ballarat & District Law Association, and is a long-standing executive member of that association. He has also been a volunteer solicitor with the local Community Legal Centre for over 10 years. Practicing In: Family law, crime and crimes compensation. Stacey practices predominantly in the areas of commercial law and deceased estates. Stacey completed her Bachelor of Laws and Bachelor of Arts in 2007, graduating with Honours in Law. She joined the firm after being admitted to the legal profession in February 2009. Stacey has significant experience in the area of wills and estates, regularly drafting wills, powers of attorney and appointments of medical treatment decision makers for her clients. She provides estate planning advice, including strategies to minimise the risk of challenges to a will. She also has extensive experience in estate litigation, often involving complicated family, farming and corporate structures. She is able to assist executors, whose obligation is to defend wills from family provision claims and also individuals seeking a fairer outcome from the distribution of estates. Stacey also acts for clients in commercial transactions providing commercial and practical advice with respect to retail leases, farm leases and lease disputes, and business sales and purchases across a broad range of industries. Stacey can also assist with general dispute resolution including debt recovery and contractual disputes. Stacey is a volunteer solicitor for the Cancer Council Australia and committee member of the Ballarat and District Law Association. Practicing In: Commercial Law, Civil Law, Wills and Estates. Michelle first worked at the firm from 2009 to 2011, completing her Supervised Workplace Training in that time. She then went on to work as a corporate solicitor at the Department of Human Services for several years, before returning to work at the firm in 2014. 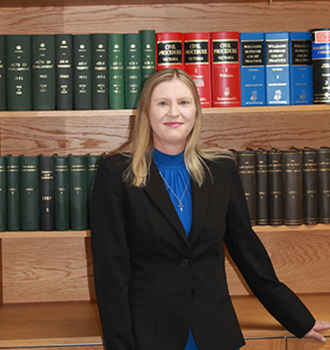 Michelle practices primarily in the area of Family Law. Michelle has a strong interest in social justice and donates a portion of her time to pro bono work, as well as volunteering at the Central Highlands Community Legal Centre. After working for the firm for more than 20 years Janine decided to study Law and in 2017 was admitted to practice as a Solicitor. She has an extensive practical knowledge of many areas of law. 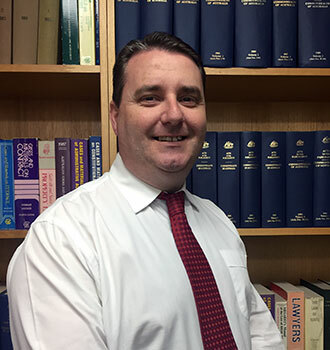 Brett is one of only three Law Institute of Victoria Accredited Specialists in Commercial Litigation in Western Victoria which results in his clients receiving the right advice, guidance and support to assist in resolving their disputes. Brett has been involved in major commercial litigation disputes and has appeared on behalf of clients before all courts and tribunals in Victoria. He assists his clients in resolving their disputes by providing quality legal advice that takes into account considerations for early intervention, mediation or a court based litigious approach having regard to the avoidance of escalating legal costs. Brett also recognises that the objectives and priorities of parties involved in litigation can differ widely. His extensive experience in advising a wide range of clients in litigious disputes will result in offering clients of Cinque Oakley Senior Lawyers a superior service and expertise in all stages involved in the process of pre-litigation advice, negotiations, mediations and court and tribunal appearances.